Taking antibiotics "may lead to detached retinas"
Although the majority of people view antibiotics as a force for good, some types of medication have side-effects, as has been highlighted in a new study by experts in Canada. The study, conducted by the Child and Family Research Institute of British Columbia in Vancouver, shows that people taking fluoroquinolones have a higher risk of developing retinal detachment. Analysis of a cohort that included almost one million patients who had visited an ophthalmologist shows that people taking oral fluoroquinolones had a higher risk of retinal detachment than nonusers. 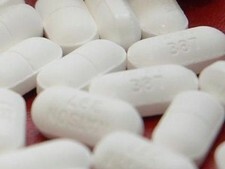 The study, published in the journal JAMA, was led by Mahyar Etminan, who explained that fluoroquinolones are one of the most commonly prescribed classes of antibiotics, with their broad antibacterial coverage and high-tissue distribution providing potency for a wide variety of community-acquired infections. Despite the drugs being historically well tolerated, they have been associated with a wide array of adverse events and linked to several forms of ocular toxicity such as corneal perforations, optic neuropathy, and retinal hemorrhages. "Despite numerous case reports of ocular toxicity, a pharmacoepidemiological study of their ocular safety, particularly retinal detachment, has not been performed. Retinal detachment is a serious medical emergency that may lead to irreversible vision loss," the study authors wrote. Through analysing the one million people in the cohort study, the researchers found that retinal detachment was associated with a higher likelihood of current use of fluoroquinolones, with 3.3 per cent of cases compared with 0.6 per cent of controls. For current users, the average number of days from the first fluoroquinolone prescription to the first event of a retinal detachment was 4.8 days, though no risk was observed among recent users or past users. The researchers stated: "Current users of oral fluoroquinolones were nearly five times more likely to be diagnosed with retinal detachment than nonusers. Future pharmacoepidemiological studies should be conducted to confirm or refute these findings."